Consisting of traditional blues elements infused with a silky-smooth pop sensibility, Overnight Success is the long-awaited follow-up to the band’s critically-acclaimed album, Somethin’s Wrong. Don’t be fooled: Despite the obvious crossover appeal of this album, there is some serious grit in the grooves here. Billy D’s seen-it-all world-weary vocals, combined with all-around ace guitar playing are the main attractions, but solid professionalism abounds throughout the eleven tracks, with supernatural rhythm section support from Joe Casimir on bass and backing vocals and Scott Van Dusen on drums. Tasty and tasteful, these solid tracks go down easy but have a kick. Billy D and The Hoodoos are a true jewel of the Portland music scene. The long awaited follow-up to Billy D and The Hoodoos’ 2013 debut album Somethin’s Wrong has finally arrived and it is filled with the same catchy songs with their bare-boned, rock-inflected riffs that made that first release so well received. Growing up in Chicago obviously influenced Billy’s musical path, blending the city’s thriving blues scene with the very best of the rock music that captured his ear during his youth. It is reflected on numbers like the very Chuck Berry-esque Can’t Get Over You or It Must Be Love with a shuffle that’d make Bo Diddley proud. The album closes with a strong performance of Willie Dixon’s classic “Back Door Man.” It is the only non-original on the album and a tremendous way to close things out. Overnight Success has been given the right amount of creativeness and timing to bring it to its perfect result. Another amazing release from Billy D and The Hoodoos! Somethin's Wrong is a collection of tunes that span the spectrum of blues. Mix one part Rock'n Blues, add some Chicago South Side swagger and sprinkle some tasty Cray-esque licks, and you've got some mighty fine tunes. The songs work together to create an "outside the box Blues Experience". Billy D's thoughtful lyrics combined with a smoking rhythm section make for a great listen. Ain't nothin' wrong with Somethin's Wrong...this fine collection alternates between soulful blues ballads (Somethin's Wrong, Blue, and Love Makes You Cry) and gritty slide guitar rave-ups such as the Thorogoodesque 50, and the stomper, Crazy Little Dancin' Queen. In the last two years Billy D and the Hoodoos’ Somethin's Wrong has charted on The Billboard Blues Album Charts once and Living Blues twice. It was named the Winner in the Blues Category of the 2013 UK Songwriting Contest, and The 12 videos from the DVD have recently surpassed the two-million-hit milestone on YouTube! The band was also awarded Best New Act by the Cascade Blues Association. Billy D’s life experience has given him the strength to write his brand of “Bluzy Rock” with a passion that only comes from living it. 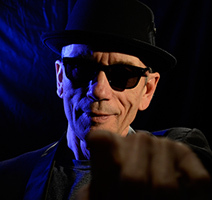 Heavily influenced by Chicago blues, Rock & Roll, and “Backbeat Roots” music of all types, his songs reflect the tough lessons of his past and show his love for Mother Blues and her first-born, Rock & Roll. Born on the south side of Chicago, Billy Desmond grew up surrounded by the Blues and early Rock & Roll— a powerful combination. He started playing professionally at the age of fourteen, primarily for teen dances and parties; and by eighteen, he was sneaking into the blues clubs of Chicago to hear such greats as Muddy Waters, Junior Wells, Buddy Guy, and James Cotton. Within a few years, Billy would be working with blues legends Junior Wells, Big Time Sarah, and Detroit Junior. By the late ‘70s, he had formed his first band, Skid City Blues Band, taking on the roles of singer, guitarist, and songwriter. After years of touring the Midwest, Billy moved to Los Angeles in 1984, studying with Blues great Tony Matthews, guitarist for Little Richard and Ray Charles. He spent half of the next year playing behind, Don “Sugar Cane” Harris, perhaps the world’s greatest blues violinist. In the mid-’90s, Billy moved to Santa Fe, and began focusing on writing and playing his original songs. Within the year, Billy D and the Hoodoos were formed. In 2003, KTAO voted his song She’s the One the number one song by a regional artist. KTAO hosts the Annual Solar Fest in New Mexico and that same year Billy and the band opened the Fest for Los Lonely Boys and Robert Cray. After several more successful years in New Mexico, Billy left the southwest for Oregon in early 2010. His first CD, Somethin's Wrong has received outstanding reviews and accolades and has been embraced by the Portland music community as well as the rest of the U.S., Canada, and Europe.